Bargain, Was £72.99, Now £50.00, very slight box damage. THIS WORLD WON'T SAVE ITSELF. Why has your mother never seen the red-eyed dust bunny in your closet? Why does the news not mention the rumblings at the old cemetery? They can't see through the Paradigm, but you can. You see the monsters in the world. Unfortunately, they see you too. They're of a mind to bring about the apocalypse, and you and your fellow saints have the power to stop them. If only you cold remember who you are. 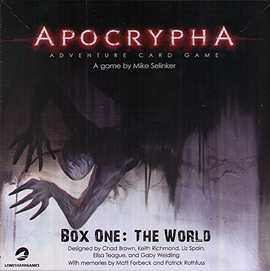 The Apocrypha Adventure Card Game is a world-spanning pre-apocalyptic campaign game, playable as a co-op card game for 1-6 players or a full roleplaying game with one player acting as a guide. The World is the foundation of your adventure into the first two of a series of ten chapters, each containing cards that detail memories written by a legendary author. These two chapters hold 18 unique missions, with all the base cards you need for any game of Apocrypha.In The Secrets of Candlepoint, explore a small town plagued by a year's worth of supernatural woes, and access the memories of novelist Patrick Rothfuss. In The Book of the Skinwalkers, get to the bottom of what's causing the were-beasts of Chicago to rage, and gain the memories of author Matt Forbeck. Adding the expansions The Flesh and The Devil will allow you to play over 70 more unique missions and reveal the twisted memories of more acclaimed authors. But hurry, because the doomsday clock is ticking.